KAWASAKI, Japan, Sept 19, 2018 - (JCN Newswire) - Fujitsu Limited, Fujitsu Laboratories Ltd., and Waseda University today announced that Fujitsu Laboratories and Waseda University have signed a comprehensive collaborative activity agreement for joint research on the Digital Annealer(1), Fujitsu's quantum-inspired computational architecture that is capable of solving combinatorial optimization problems with stunning speed. The organizations have established the Fujitsu Co-Creation Research Laboratory at Waseda University, within Waseda's Green Computing Systems Research Organization, as a joint research organizaiton to promote software development aimed at resolving real world combinatorial optimization problems in society using the Digital Annealer. This organization draws topics from Waseda University's entire body of research, using the Digital Annealer to conduct research in a variety of fields, including finance, digital marketing, and logistics. Ultimately, Fujitsu will incorporate the results of this joint research into its Digital Annealer business to contribute to practical social and economic advancements. Throughout contemporary society, in fields like healthcare, finance, logistics, and the public sector, there is complex decision-making traditionally handled by humans, as well as the selection of optimal solutions based on massive amounts of learning input data, and many other enormous real world issues that cannot be solved in a practical timeframe with conventional computing technology. 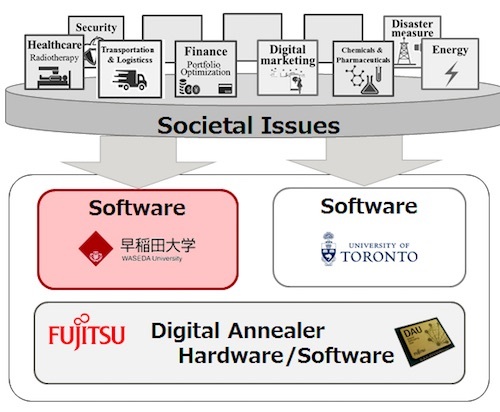 To find solutions to these sorts of problems impacting society, Fujitsu Laboratories leveraged existing digital circuit technology to develop a computational architecture that can solve combinatorial optimization problems with breathtaking speed--the Digital Annealer, which Fujitsu commenced offering as a service in May 2018. For its part, Waseda University has been an active collaborator on research conducted jointly between academia and industry. It has played a leading role on the front lines of quantum annealing research and research into combinatorial optimization problems. In 2011 the university established its Green Computing Systems Research Organization. Fujitsu Laboratories and Waseda University have concluded a collaborative activity agreement fusing the two organizations' research regarding software development to be applied to real world combinatorial optimization problems in society. They have now established the Fujitsu Co-Creation Research Laboratory at Waseda University, fostering a shared understanding with regard to subjects such as research, development, and personnel training. Fujitsu and Waseda will move forward on joint research at the new laboratory in April 2019. The joint research at the Fujitsu Co-Creation Research Laboratory will be based on candidate research themes taken from the entire breadth of topics being researched at Waseda, and use the Digital Annealer to conduct joint studies in various applied fields, beginning with finance (predicting stock price changes), digital marketing (data analysis), and logistics (optimizing delivery). In the field of finance, there are applications such as the clustering method of analysis in predicting stock price changes, which takes into account the feature value of numerical and text data in financial statements, used for credit ratings, as well as applications to arbitrage calculations for foreign exchange. In order to perform accurate calculations, however, there are many issues that need to be resolved, such as the need for further improvements in speed and accuracy for both the hardware and software. In the field of digital marketing, there are high expectations for the creation of new data analysis methods to maximize the effect of marketing activities. For example, to make better suggestions based on information about customer activities, it is necessary to solve a combinatorial optimization problem consisting of numerous optimization parameters. Moreover, in order to present the customer with optimized information in real time, the problem has to be solved in just a few seconds. In the field of logistics, the most important issue is reducing logistics costs, and a significant contribution to this goal can be made by rethinking logistics networks and optimizing delivery. Delivery optimization requires solving a combinatorial optimization problem with a variety of constraints, including specified delivery time and number of vehicles. Moreover, it is essential to create an optimal delivery plan as traffic information is also constantly changing. Fujitsu and Waseda University believe that by extending the range of use cases scenarios for the Digital Annealer and developing applied software, it will become possible to solve real issues in these fields. By continuing in their efforts in various fields, starting with the topics introduced above, the partners will ultimately develop Digital Annealer technology and expand its practical application to society. The new collaboration between Fujitsu and Waseda University represents the latest in ongoing efforts to partner with relevant organizations to promote the continued development and application of Digital Annealer technologies. Previously, Fujitsu Laboratories entered into a strategic partnership with the University of Toronto in fiscal 2017, and continues to work closely with a number of companies that are looking to solve combinatorial optimization problems relevant to their businesses. Through these initiatives to build a Digital Annealer community, Fujitsu Laboratories seeks to contribute to the creation of new ICT business as well as social and economic advancements. (1) Digital Annealer "Fujitsu Quantum-Inspired Digital Annealer Cloud Service to Rapidly Resolve Combinatorial Optimization Problems" (press release dated May 15, 2018).